On this 'Combined Operations Insignia In Use' page you'll find a wide variety of examples of the Combined Operations Insignia in use from the 1940s to the present day. If you have any examples you're happy to share, please send them in with a brief note for possible addition to this page. 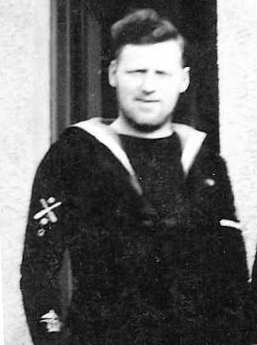 Robert George Smith, Stoker 1st class, C/KX571807. Stoker Smith served on landing craft in WW2 including in Burma. He was so proud of his service in the Combined Operations Command that he made his own shield which stood above a passage door for all to see. It now sits proudly in my dining room and often causes comment and questions particularly from youngsters. Stacey Davies, Granddaughter. 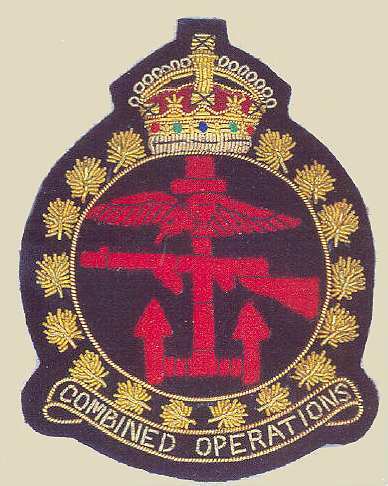 Canadian Combined Operations; The No. 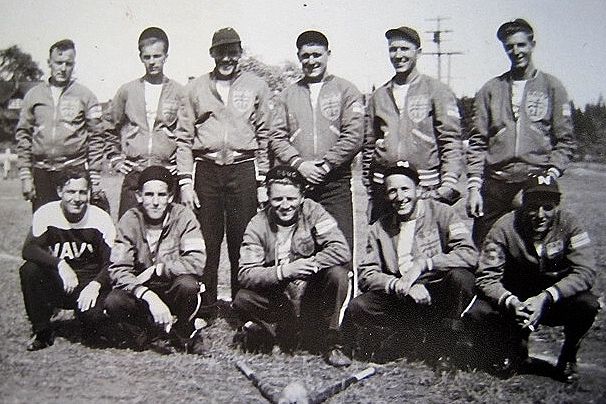 1 Navy Ball Team 1944 at Comox, British Columbia. Note the Combined Ops badge on their jackets. Back row, left to right: Unknown, E. Chambers, Alec Bruce, Bill Erycan, George Hobson & Chuck Rose. Front row, left to right: Unknown, Jim Malone, Doug Harrison, Art Warrick & Joe Spencer. Thomas Arnold John Jones (Arnie) No. KX 525510 Stoker 1st Class 1943 - 46 who served at HMS Cricket (Landing Craft Base, Burseldon) and HMS Hornet (Independent Command, Gosport), RN Bases and on MTBs (Motor Torpedo Boats) as part of Coastal Defences. The little girl in the picture is my sister, although poorly at the time, she celebrates her 70th birthday this year. I'd like to thank the members of RN Coastal Defence Veterans (London Branch) for leading me to your excellent site. I intend to help with awareness and contributions to the Combined Ops Memorials, great to know how many people are involved! Will ye no come back, yes we will !! Best Wishes, Chris Jones. 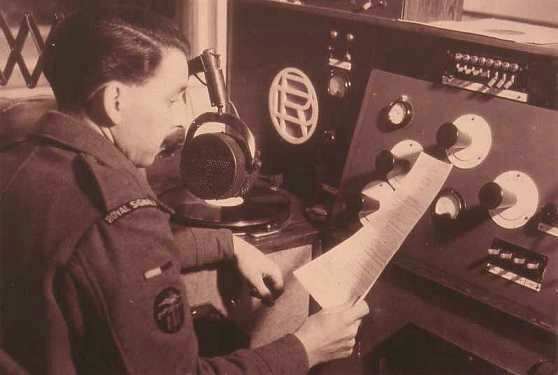 John Rufford Hodgett broadcasting on Radio Gibraltar. 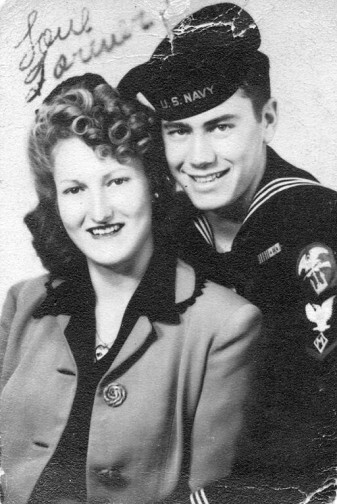 His son writes; My father spoke little about his war service but I believe he was part of a mixed group of men that set up communication posts in France. One year around D-Day, while we watched the movie "The Longest Day," he said his lot wore a white band around their helmets. I think he was in the Sherwood Foresters. He was born in Keyworth, near Nottingham and died age 70 in 1993. John Hodgett. 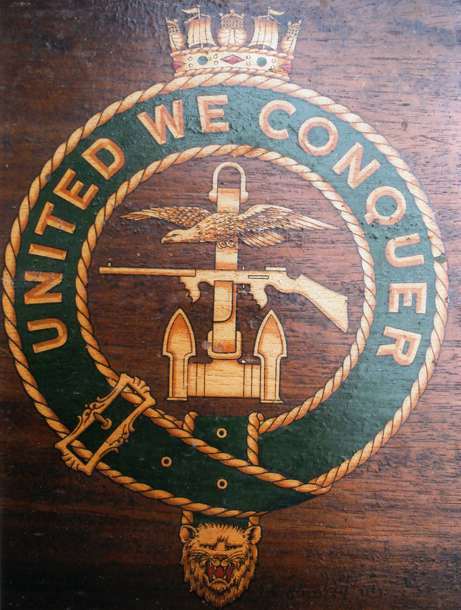 Bill Newell, ex W Commando writes from Canada; Many years ago before I became aware of the existence of either the RN Commando Association and crest or the Combined Ops. Association and Crest, I designed, and had made, the one I now wear on my blazers. 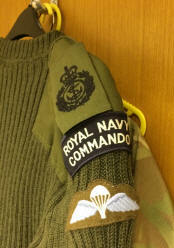 See Bills message at the bottom of the RN Commando page. 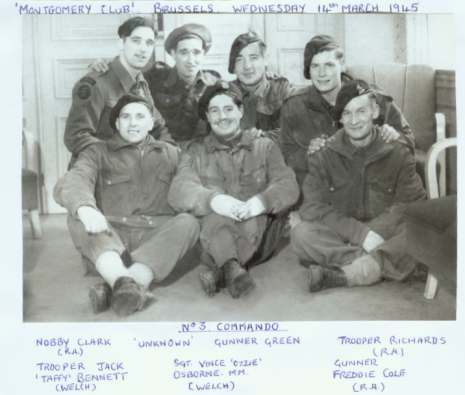 No3 Commando taken at the 'Montgomery Club' Brussels on Wednesday March 15th 1945 showing Commandos on a two day respite from the snow covered Holland countryside. Jack 'taffy' Bennett of No3 commando. His grandchildren, Scott Thompson, Louisa Davies, & Ross Morgan from Caerphilly, South Wales, taken on Sunday, June 6th, 2004 at Benouville during the 60th Anniversary ceremonies. 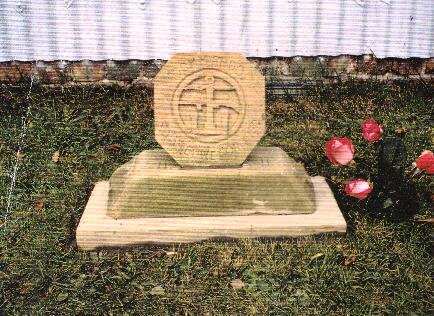 Note the Combined Ops Insignia proudly displayed in his memory. 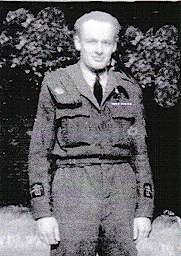 Sgt L G (Les) Ellis DCM, 1942/43 in England. 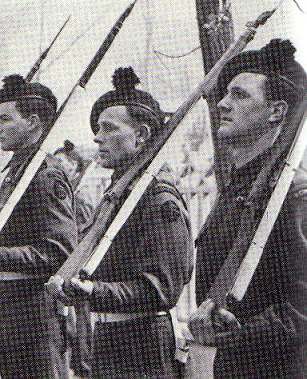 Front left in the photo, he was an instructor at the 2nd Division Sniper School with the Royal Regiment of Canada. The CO patch is clearly visible on his left arm. 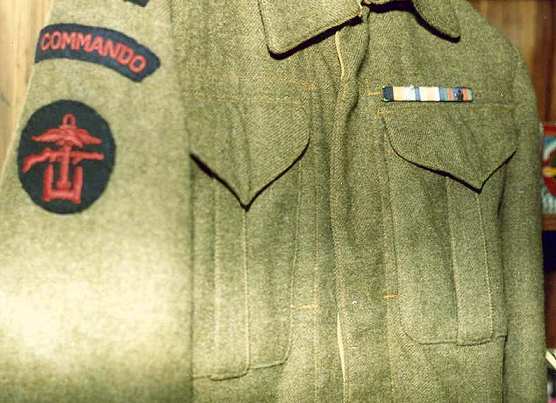 A 2nd CO patch (just visible) is on the left arm of the servicemen in the back row 3rd from the left. Instrument Section at RAF Dundonald in Ayrshire, Scotland. 516 Squadron was attached to Combined Operations and this may be the only plane ever to bear the Combined Operations insignia. See 516 Squadron for information about the squadron's role in Combined Operations training. 9 Commando Guard of Honour. No 9 Commando, which was part of No 2 Commando Brigade, Headquarters, Mediterranean Theatre provide the guard of honour on the 6th April 1945. 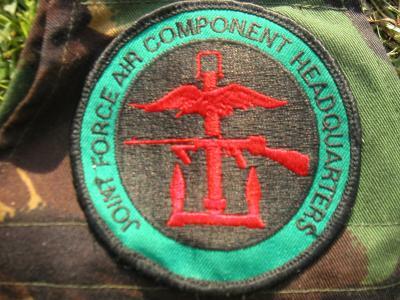 They are wearing a black feathered hackle in their Green Beret with the round version of the Combined Operations red design on dark blue, with a shoulder title of white letters on black. 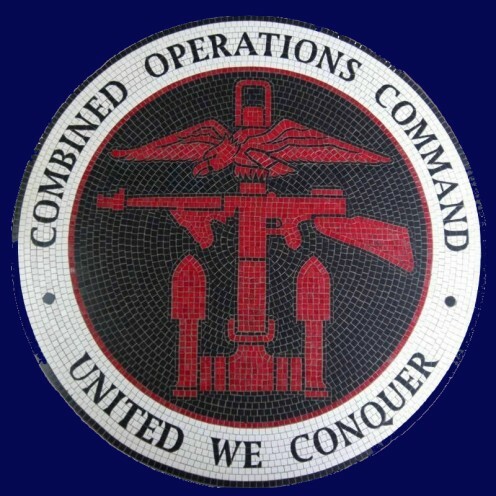 US Army Wear Combined Ops Badge. Extract from official WW2 records held at the Public Records Office, Kew, London. 19th Sept 1942 - US Army are now wearing their own version of the Combined Operations Badge, which is very similar to ours. These were worn by members of the Engineer Amphibian Corp. These badges were produced with the American Eagle replacing the original; embroidered in yellow on a light blue backing. 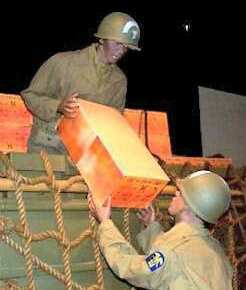 Photo shows provisions being delivered on Omaha Beach on D-Day + 2 or 3. 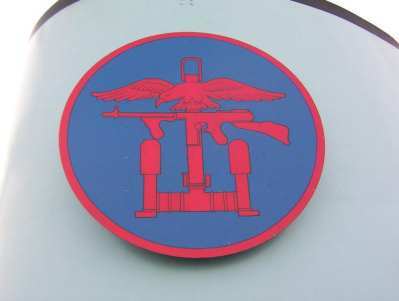 The Combined Operations insignia are on the left upper arms and on helmets. 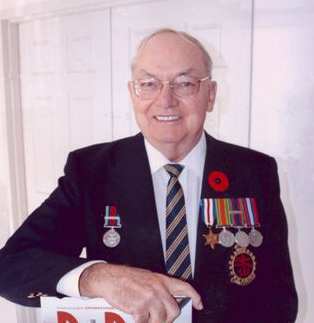 Les Ellis DCM CD wearing his many medals with pride including the coveted Dieppe Bar (with the Combined Operations Insignia) on his Canadian Volunteer Service Medal. Lance Corporal Ellis earned the Dieppe Bar and the Distinguished Conduct Medal in the Dieppe action at Puys on August 19 1942. Les was born in Ogmo Vale, Wales, UK and lives in Ontario, Canada. 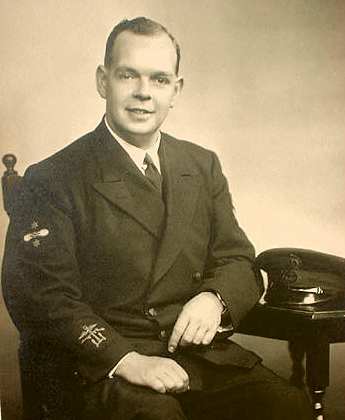 LAC Karl Work in England shortly before his return to Canada in 1945. He served on Fighter Direction Tender 217off the Normandy beaches. The FDTs provided radar cover, intelligence gathering and fighter direction until land based mobile radar and communications units established themselves in Normandy. Click here for the full story of FDT 217 and her sister vessels FDTs 13 and 216. 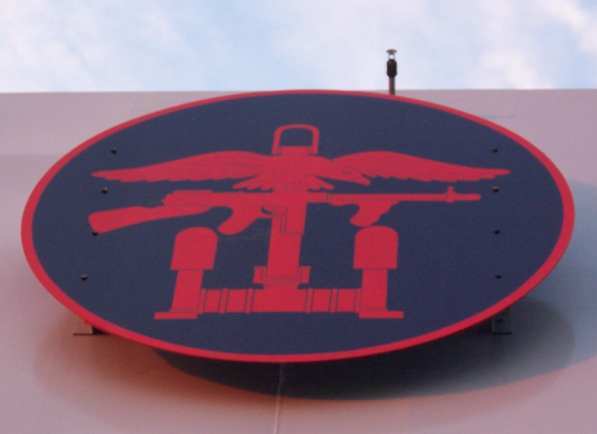 Insignia on lower arms. Henry John Clifford Elcome, known as Cliff to his friends in 1943/44. He joined the RAF in 1942 as a 'Volunteer Reserve,' later volunteering for the RAF Servicing Commandos. 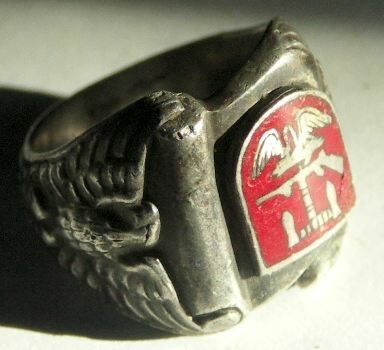 He was posted as a Leading Air Craftsman (LAC) to 3204 Unit where he took part in the Sicily/Italy invasions. When the unit was disbanded in February 1944 he returned to the UK to serve in the 2nd-Tactical Air Force at various UK bases. Harold R. Smith, Leading Seaman, RCNVR had this photo taken in the spring of 1944. He was about 23 years old. 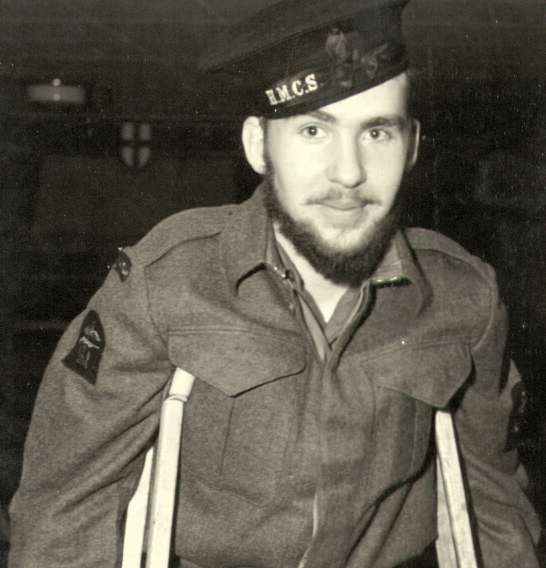 He had been wounded during the landing at Reggio [Italy] and was back in Canada at the time of this photo. 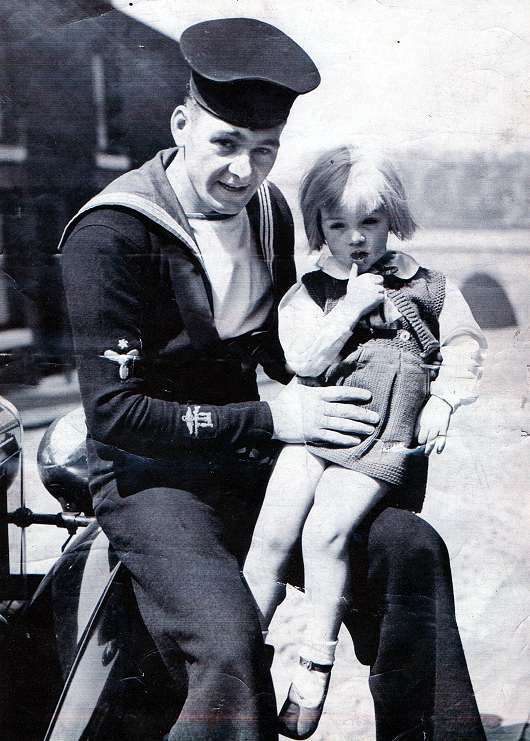 He volunteered for the RN Commandos in 1942 and was assigned to LCI(L)115. He was one of two Canadians (the other being the Captain) on the ship. 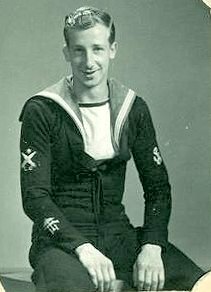 He had been in action in North Africa, Sicily and Italy before being wounded while his ship was reloading for a return trip to the landing beaches at Reggio. 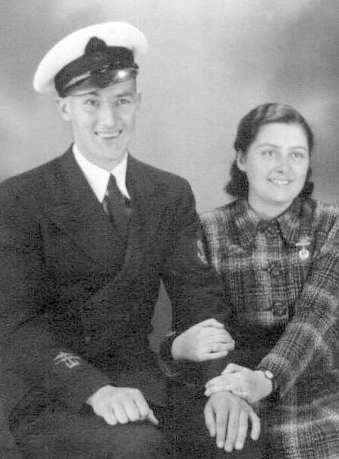 He now lives on Vancouver Island in Courtenay, B.C., Canada with his wife who he married in 1944. 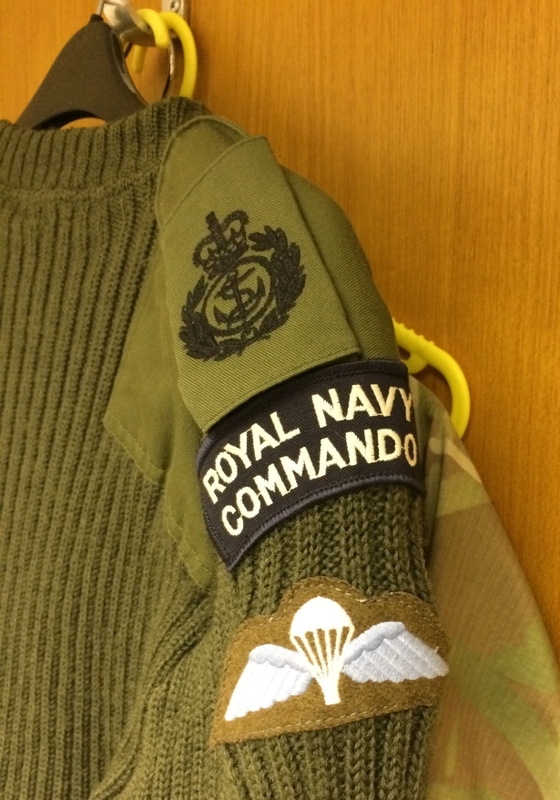 Royal Navy Commando shoulder title on a JWH (Jersey Wool Heavy standard issue pullover) of a serving RN Commando Chief Medic - one of only six still serving in November 2014. Click here and scroll down to item 13 for more information. RN rating's square rig top and collar. The collar is named to a K PENNY but there are no marking or name on the square rig. 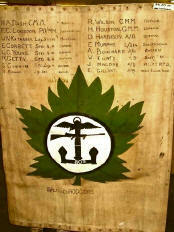 This historic navy hammock reposes in the Esquimalt Navy Museum, Vancouver Island. Merchant officer, James Robertson, borrowed a hammock in 1943 while aboard the SS Silver Walnut on a trip from the UK to the Mediterranean, via South Africa. 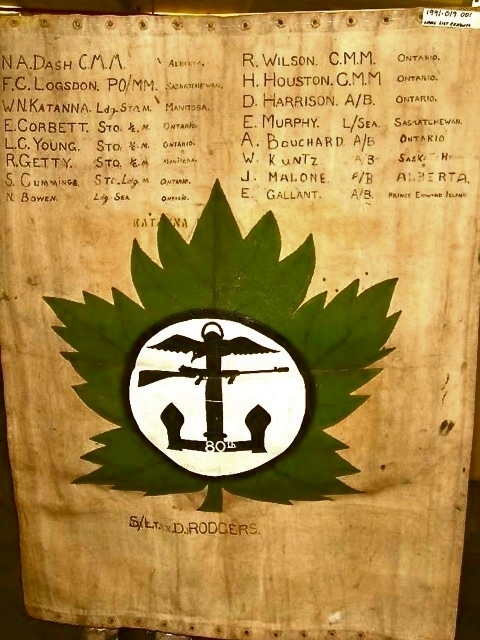 He embellished it with the names of his Canadian companions and the Combined Operations badge, over a maple leaf. Over 40 years later, he returned the hammock to the Canadians at a ceremony in Australia. Click on images to the right for more information. A badge design, possibly a ship's badge, which includes the Combined Operations Badge in the middle. 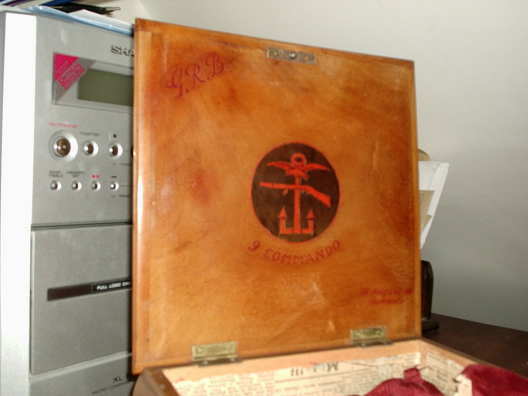 It is is in the centre of a wooden tray which I found at a Militaria Fair. On the back was a small piece of paper with the letters COSD, perhaps a clue to who would have used this design. Yours sincerely, Terry Carney. 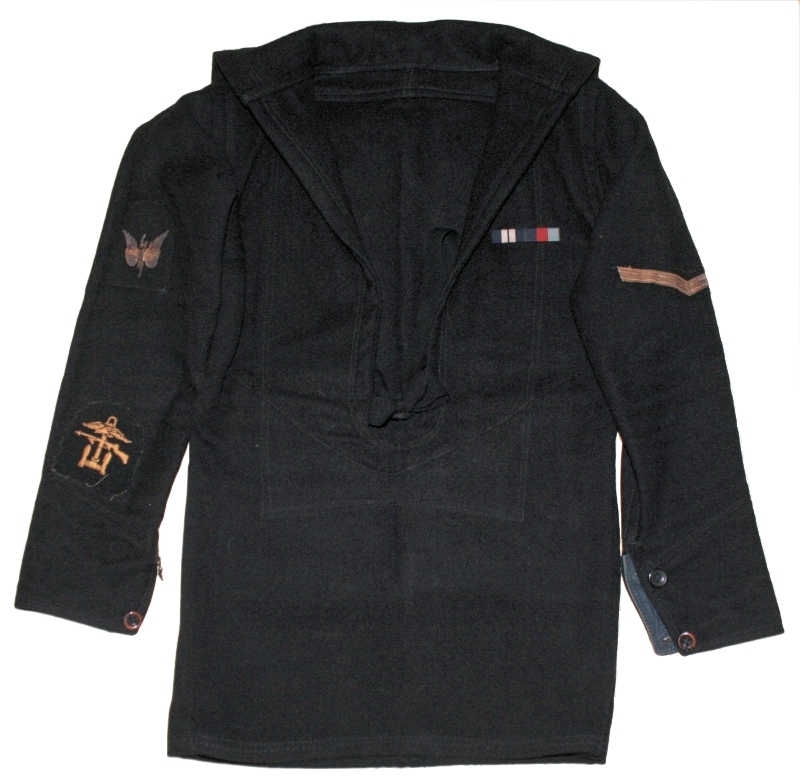 Bill Newell's battle dress tunic. He was a member of a small Canadian Commando Unit designated 'W' Commando. This is his with the round CO badge which was worn by all ranks. 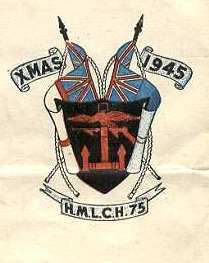 LCH 75 Christmas Card. It's Christmas 1945 and Headquarters ship, LCH 75, was on its way to Norfolk, Virginia after being recalled while steaming eastwards in the Indian Ocean. 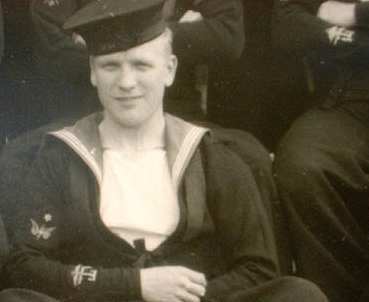 When she dropped anchor in Aden, Austin Prosser, gunnery officer and watch keeping officer, sent a copy of the ship's Christmas Card to his parents in England. Click here to read Austin's account of his wartime service and to see the inside of the card. This is 1:12th scale DUKW nearing completion (working lights still to be added). It has a fully operational 6 wheel drive/differential system, steering, propeller and rudder. 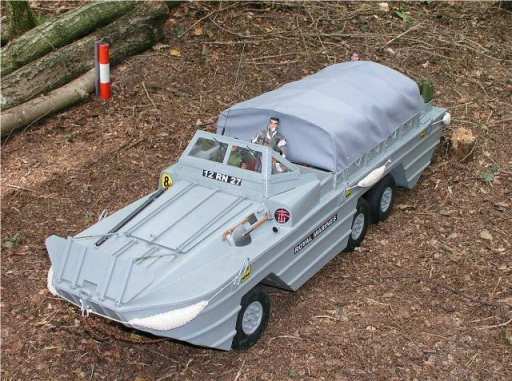 It is fitted out as a WW2 Royal Marine amphibian. The Ultimate Act of Remembrance! I'm a tattoo artist in Chelmsley Wood, Birmingham. 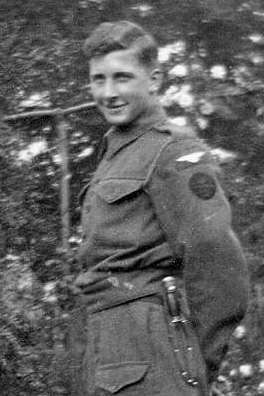 I tattooed the Combined Operations Insignia on the right forearm of 78 year old Mr `Dicky` Bird. 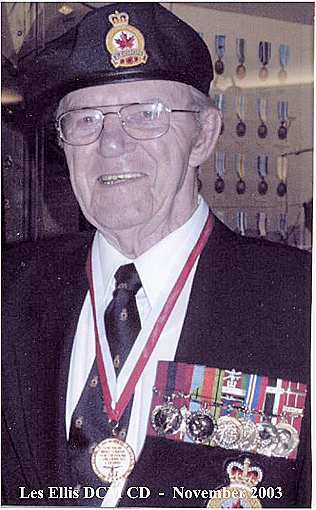 He took part in the Normandy landings on June 6th, 1944 and Walcheren in early November, 1944. I was so taken by this extraordinary character that I did a search for the best insignia I could find and landed upon your site. It was his first ever tattoo and he said he most definitely plans to have another on his left forearm. May I commend you on a most informative & enjoyable website. Thanks. Jon Davis. 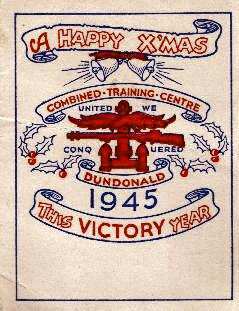 Christmas 1945 at RAF Dundonald, Ayrshire, Scotland. This locally prepared festive poster from Christmas 1945 celebrates the successful conclusion to WW2. If you'd like to read about RAF Dundonald, which was part of the Combined Training Centre, read about 516 Squadron. 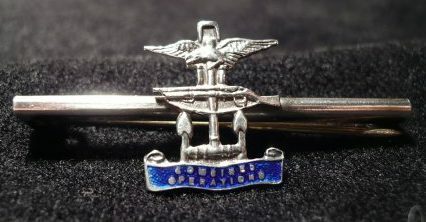 The Funnel Badge of the Royal Fleet Auxiliary's Sir Tristram taken in June 2004. The legacy of WW2 Combined Operations lives on! Memorial at Ouistreham, Normandy to the Royal Navy and Royal Marine Crews. 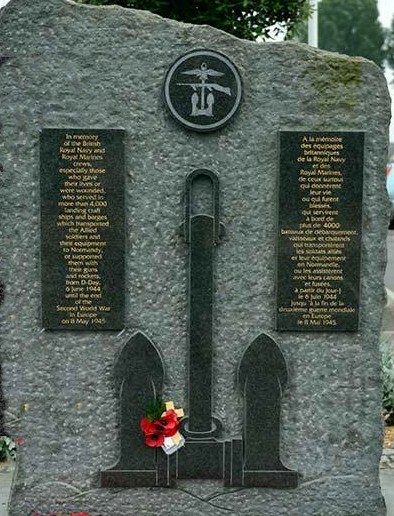 It reads "In memory of the British Royal Navy and Royal Marine Crews, especially those who gave their lives or were wounded, who served in more than 4000 landing craft, ships and barges which transported the Allied soldiers and their equipment to Normandy, or supported them with their guns and rockets from D Day, June 6th 1944 to the end of the Second World war in Europe on May 5th 1945." Burma Star ribbon, Atlantic Star ribbon with rosette and South Africa War Service Medal ribbon. The rosette with the Atlantic Star, is worn when ribbon alone is worn and indicates the recipient was also awarded one of two possible clasps for the medal: 1) Air Crew Europe - Awarded to RAF and Commonwealth aircrew Atlantic Star recipients who subsequently qualified for the Aircrew Europe Star and 2) France Germany - Awarded to Atlantic Star recipients who subsequently qualified for the France Germany Star. Only one clasp could worn. We are grateful to Jeff Hannan of Warrington for an explanation of the ribbons opposite. 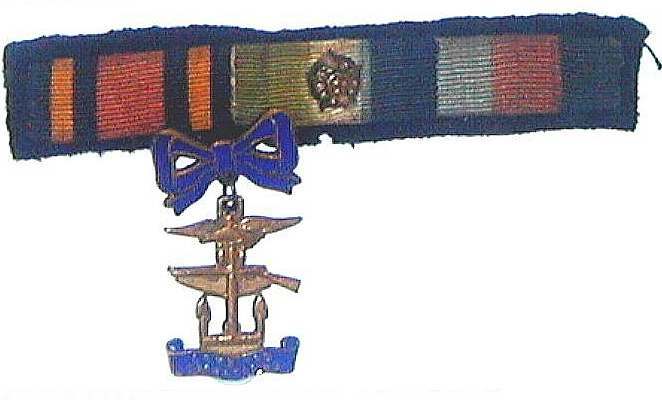 The South African War Service Medal is a little unusual to see as it was awarded for unpaid voluntary service of 5 or more hours per week, in or outside South Africa, in one or more of the officially recognised voluntary organisations. What the original enquirer referred to as "The Combined Operations Medal" is the only example I have ever seen of what I believe to be a WWII Combined Operations sweetheart brooch worn by wives, mothers or girlfriends. Canadian Volunteer Service Medal. This particular medal has the Dieppe Bar with the Combined Operations Insignia. 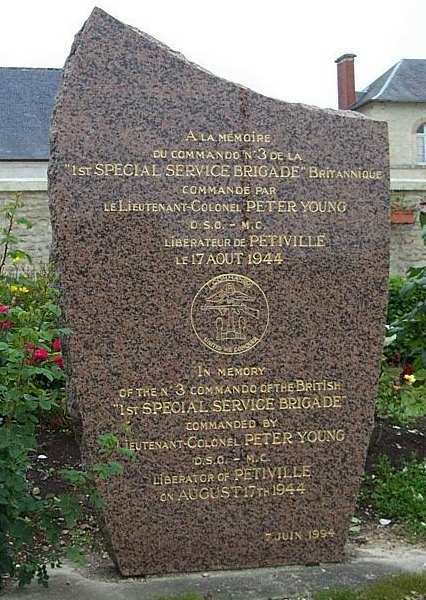 The bar was awarded to those who took part in the Dieppe Raid of August 19 1942. 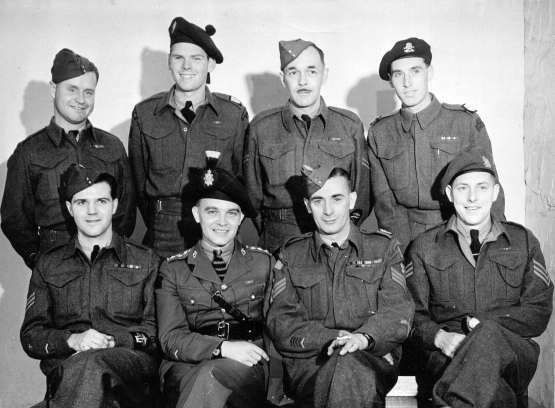 All ranks and branches of the Canadian Armed Services were eligible for the CVSM on honourable completion of 18 months total voluntary service between 3/9/39 and 1/3/47 while on active service. On this particular example there is also the Overseas Service Bar which was awarded to those who spent at least two months overseas. The inscription reads 1939 CANADA 1945 around the top and VOLUNTARY SERVICE VOLONTAIRE around the bottom. 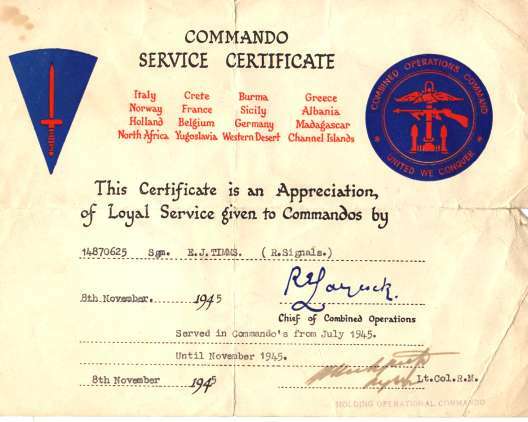 The Combined Operations badge is still in use today as this e-mail and the funnel badge above confirm. The Combined Ops badge is currently worn by the staff of the Joint Force Headquarters (JFHQ) which is the deployable element of the UK's Permanent Joint Headquarters (PJHQ) based in Northwood. 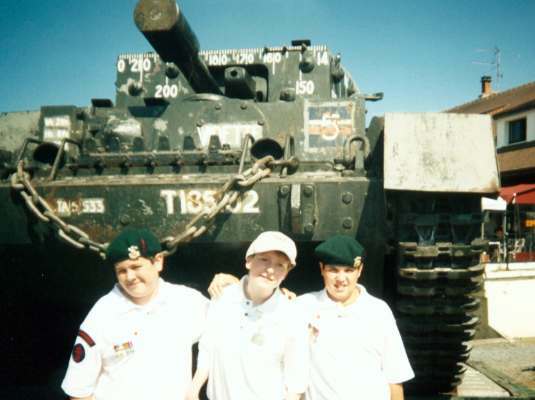 This explains why it is worn by a large variety of cap badges and all three services. PJHQ staff wear a similar badge, smaller but on a square background of the three colours of the Services (i.e. Dark Blue for Navy, Red for Army and light blue for the RAF). I know - I used to wear one! Any information on the post war period will be warmly welcomed. Use the 'contact us' link at the bottom of this page. Elsewhere on this website read about the badges design and development, see specimens in close-up and a short biography of the badge's designer, Lt D A Grant.